The Lumineers! I’ve been a fan for a few years and am happy to say that I am an even bigger fan now, after having seen them in concert. Here they are, covering the Talking Heads song “This Must Be The Place” and here’s a nice song, Dead Sea. Oh, but maybe you stopped by to hear Ho Hey? Posted on September 17, 2017, in Photography and tagged 365 photo project, black and white photography, colorado, learning to see, Leica, melinda green harvey, monochrome, one day one image, photo a day, photography, postaday, the lumineers, thoughtful seeing. Bookmark the permalink. 4 Comments. Thanks – the band did me a solid by leaving the main stage and playing from the one in the photo. 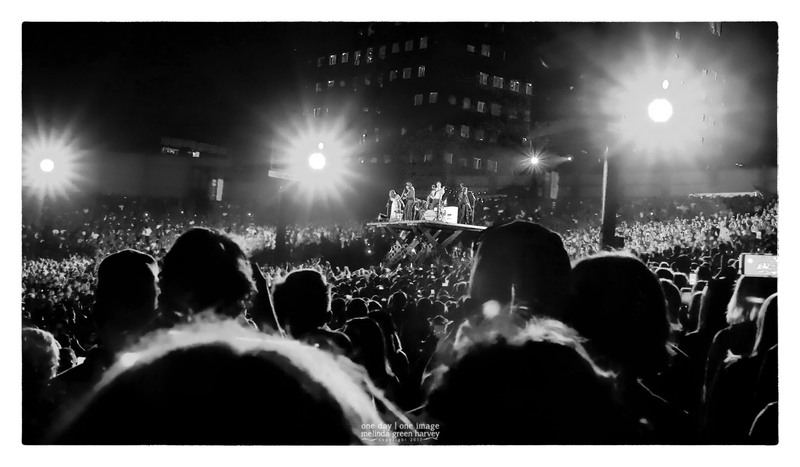 Everyone turned to look at it, which opened up a view that’s not typical of a concert. It was a very good show. And it was outdoors, too. The next night we saw another band at Red Rocks Amphitheater, which is just about the best concert venue there is!